The faucet/PTC/Video site courted controversy recently when it abruptly shut down its mining game leaving many users out of pocket. They felt that they were not given enough warning about the move, while Cointiply insisted they were forced to close the game because they had incorrectly calculated the payouts and it was no longer sustainable. Some users have been offered compensation, although many have claimed it is too little too late and are unhappy with the settlement. But wherever the truth lies, Cointiply shows no sign of disappearing anytime soon and the chat facility demonstrates the owner’s desire to build the website back up again after shedding much of its core user base through the loss of the mining game. Now, when you open the Cointiply home page, you’ll find a slice of your screen automatically taken up with the live chat window, with an option to close it in the top righthand corner. Aside from the obvious benefit of a chat function of building user loyalty, we’ve seen people request help and instantly get a response from a support mod. This is an excellent facility and one which many faucet websites are lacking as a common criticism levelled at them is the lack of support. 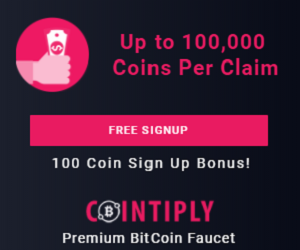 In our previous review of Cointiply we were impressed by how well designed the site is and how many ways there were to earn free bitcoin without any cash outlay. In its current form however and since the death of the mining game and what appears to be fewer videos to watch in return for payment, Cointiply is effectively just a glorified faucet. But we hope that over time it can rebuild its reputation and add new and innovative ways for its users to earn cryptocurrency. Signing up to Cointiply is a very straight forward process and requires nothing more than a bitcoin address which you can get for free from many different providers. We recommend Coinbase because we’ve used it for some time and found it reliable and secure. 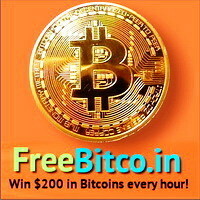 We also get $10 worth of bitcoin if you sign up using our referral link and buy or sell more than $100 worth of cryptocurrency. The great thing is that so do you! However, you don’t need to spend anything and can simply use the service as a place to store, spend or trade your earned coins. We also suggest that Cointiply users set up a free FaucetHub account as this enables you to make lower value withdrawals. FaucetHub is a completely free bitcoin microwallet which enables you to collect all the coins you’ve claimed from faucets into one place. Once you’ve reached the FaucetHub withdrawal threshold you can then send the coins to whichever bitcoin address you choose. Explainer: Faucets are websites that offer visitors tiny fractions of bitcoin and other cryptocurrencies completely free in return for completing a Captcha. They do this because they carry advertising on their pages and they hope to earn more money through visitors clicking on these then they pay out through faucet claims. Some faucets are very successful and have been around for years, while others come and go in the blink of any eye. If you want to discover which faucets pay the best and are the most reliable then check out our guide here.